This feature is not new, but it has become more difficult to control in Windows 10. I never cared for the messages that Windows’ Security and Maintenance functionality would throw on the desktop; ever since I upgraded to Malwarebytes 3, I noticed an increase in messages stating to check virus protection. This is caused by Malwarebytes 3 failing to enable some of its protection modules at times. The main issue with these messages is that they take focus. If I type in a browser, and one of those messages pops up, the last ten or so characters that I typed would end up in nirvana due to the lost focus of the browser window. Another issue is that they play a sound on top of that. First, the things that don’t work: You find a lot of tutorials online to turn off the Action Center. But turning off the Action Center won’t neccessarily turn off the notifications that Windows throws when it detects an issue on the system. 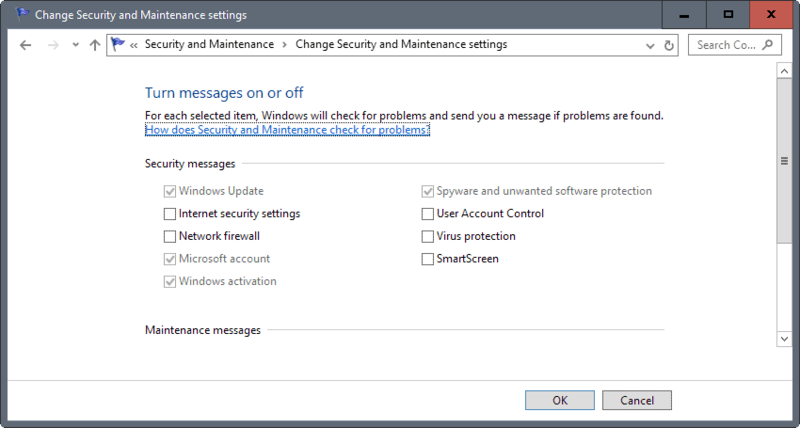 Additionally, turning messages off under Security and Maintenance > Change Security and Maintenance Settings, does not work either. You may disable virus protection security messages there, but a quick test revealed that Windows would still throw “check virus protection” messages afterwards. Hiding the Action Center icon in the Settings application won’t stop Windows from displaying security and maintenance messages either. Two methods exist to disable security messages on Windows 10. One is a policy, the other the corresponding Registry key. The Group Policy Editor is only available in Windows 10 Pro and Enterprise editions. It is not available in Home editions. If you run a Home edition, skip this option and jump directly to method 2 below. If you don’t know which version of Windows you are running, use the keyboard shortcut Windows-Pause to find out. Windows displays the version, e.g. Windows 10 Pro, at the top of the window that opens. 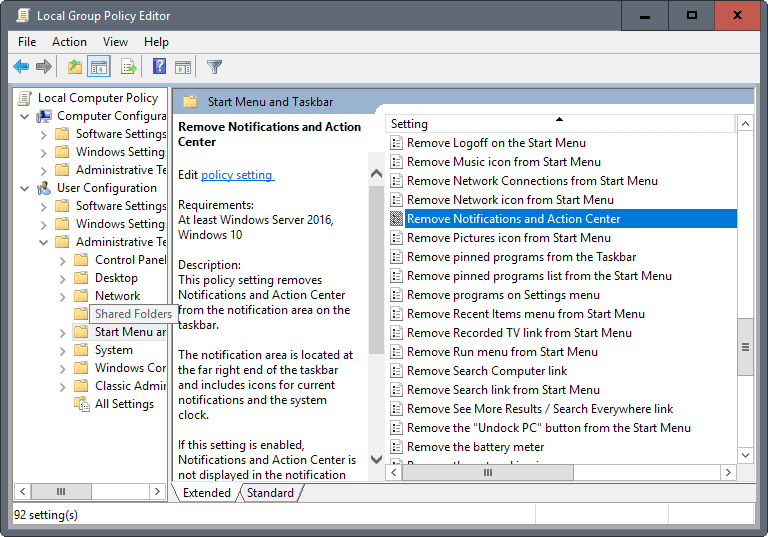 This policy setting removes Notifications and Action Center from the notification area on the taskbar. The notification area is located at the far right end of the taskbar and includes icons for current notifications and the system clock. If this setting is enabled, Notifications and Action Center is not displayed in the notification area. The user will be able to read notifications when they appear, but they won’t be able to review any notifications they miss. If you disable or do not configure this policy setting, Notification and Security and Maintenance will be displayed on the taskbar. A reboot is required for this policy setting to take effect. You can make the same change directly using the Windows Registry Editor. The file disable-security-notifications.reg disables security notifications on your PC when executed, while enable-security-notifications.reg enables the messages again. This entry was posted on Friday, April 14th, 2017 at 10:30 am	and is filed under tech tips. You can follow any responses to this entry through the RSS 2.0 feed. Both comments and pings are currently closed.